Toyota Canada Vice President Stephen Beatty, left, Hyundai Canada CEO Don Romano, middle, and Klaus Berger, vice president of the fuel cell division at Mercedes-Benz Canada, discuss hydrogen-based fuel technologies at the Automotive Parts Manufacturers Association in Windsor, Ont. WINDSOR, Ont. – Ontario has an opportunity to become a global leader in hydrogen-based fuel technology if it builds the infrastructure to support it, a group of auto executives said. Hyundai Canada CEO Don Romano said Ontario over-produced six terawatt hours of electricity in 2015, translating to roughly $600 billion of electricity that was ultimately sent elsewhere. He said it would be smart to instead use that electricity in the production of hydrogen. Doing so, he said, could make Ontario one of the world’s leaders in generating hydrogen for fuel-cell vehicles. 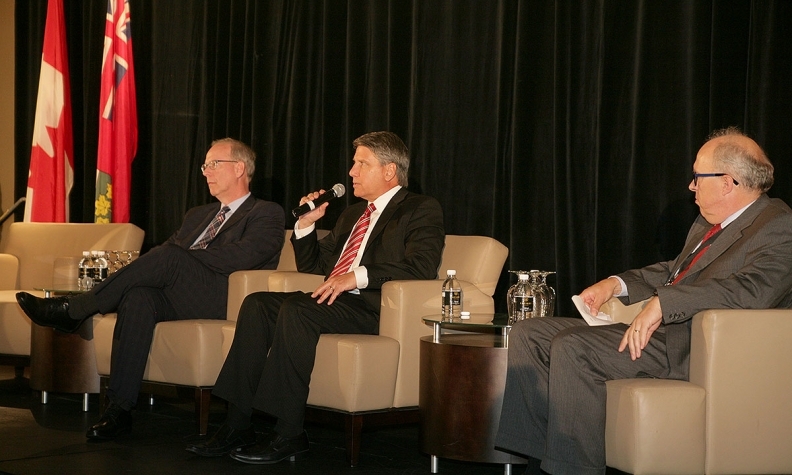 Romano, who spoke on a panel at the annual convention of the Automotive Parts Manufacturers' Association in Windsor on June 15, with Stephen Beatty, vice-president of Toyota Canada, and Klaus Berger, vice-president of the fuel cell division at Mercedes-Benz Canada, said automakers must work to educate consumers, policymakers and regulators about the benefits of hydrogen-powered vehicles and erasing concerns about their safety. Hydrogen-powered vehicles emit only heat and water, and no greenhouse gas emissions, but hydrogen accessibility, concerns over the vehicles’ costs and the durability of the vehicles are all concerns that have been expressed by consumers. “You can imagine how difficult it is when we go to the government and we try to explain what it is that makes that vehicle move, but it’s a challenge that will be overcome through education,” Romano said. He said Hyundai is working with the government and with companies such as Shell to get hydrogen fuel pumps in place. He said hydrogen-based vehicles are ready to go, but it would be difficult to sell many of them until it becomes convenient to fill up the fuel tank. “We have everything we need, but what we don’t have is fuel pumps,” he said. Beatty said getting the province to invest in hydrogen infrastructure could allow it to reap economic benefits down the line. If Ontario can use excess electricity to make hydrogen and store it … “that, to me, is an enormously powerful economic motor for Canada,” Beatty said.